My six-foot-by-four-foot illustration of three different Silurian environments in Southern Ontario is now on display at the Giant’s Rib Discovery Centre in the Dundas Valley Conservation Area. The Centre is open on weekends from 10 AM to 3 PM. From left to right, I’ve illustrated a muddy bottom community (the Rochester Shale), a reef (the Guelph Formation) and near-shore lagoon (the Williamsville Formation). 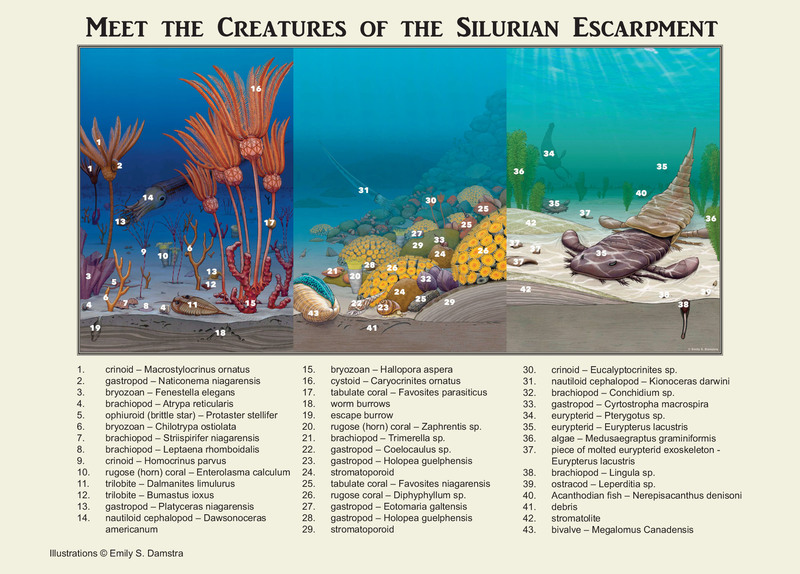 Included are trilobites, eurypterids, cephalopods, megalodont bivalves, gastropods, cystoids, crinoids, a brittle star, brachiopods, bryozoans, tabulate and rugose corals, stromatoporoids, stromatolites, and algae. See the names of all 43 different creatures here. These ancient seas existed in the Silurian period of Earth’s history, near what we now call the Niagara Escarpment. 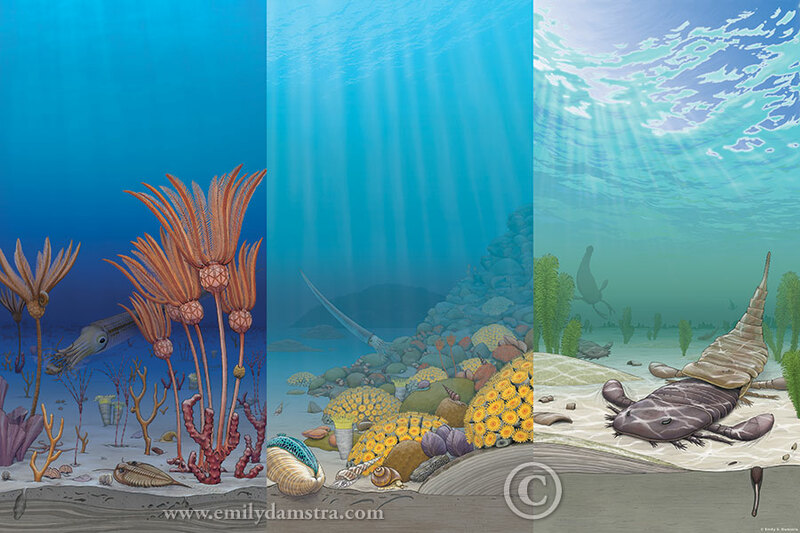 Find out more about the ancient seas and the fossils I’ve illustrated here. This graphite and digital color illustration is the product of some pretty intense research, and I’m extremely grateful for guidance from paleontologists Carlton Brett, Frank Brunton, and Matthew Vrazo. Some valuable reference photos also came from fossil collector Paul Chinnici, who along with Kent Smith authored a just-released book about the Rochester Shale fossils. This beautiful new book also includes a detailed chapter on the stratigraphy and paleoenvironments by Carlton Brett, illustrated with the Rochester Shale portion of my illustration above. The book is available here. I write more about the book and describe my visit to the Caleb Quarry (Rochester Shale) in an earlier post. All are invited to the Grand Reopening of the Giant’s Rib Discovery Centre on October 17, 2015. The opening will coincide with a reception for an exhibit of science and nature illustration by the Southern Ontario Nature and Science Illustrators. I’ll post details when I have them; the agenda is not yet settled. I want that to be three walls in a kids’ room.